The King meets the Lord... Lord Mayor, that is. 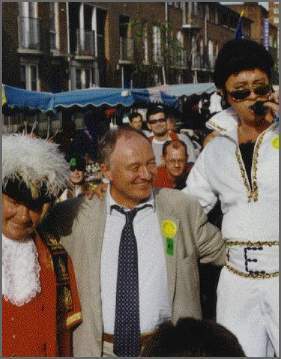 Yes, the democratically elected scourge of New Labour, "Red" Ken Livingstone tried recently to bask in the reflected glory of the King. It was a sorry sight as midget Ken, (real height 4' 7") stood on a box loaned to him by Tom Cruise and tried to grab the mic during a celebration of Car-Free day that the great man supports. I didn't let him, of course, so he dejectedly drove away with his entourage of 5 Jags. Better luck next time, Ken. I was not initially a supporter of his congestion charge idea, but I concede it is working. What a geezer. I voted for Susan Kramer, myself... but am thinking of standing against him next time round. Why not write in my guestbook to register your support for me as the first Chinese Mayor Of London.